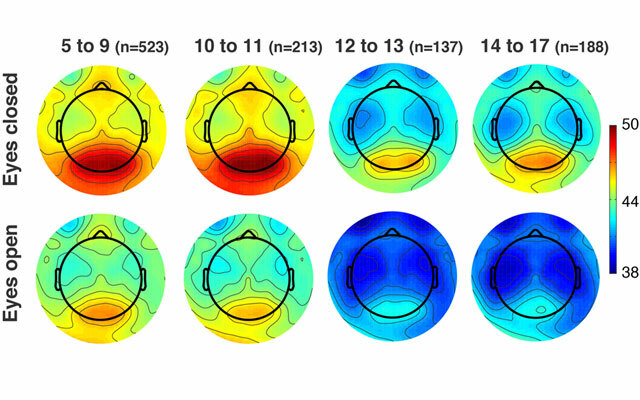 Results of processing 2,194 128-channel EEG datasets from the Child Mind Institute database. Alpha power (color unit, relative power in dB) decreases with age (age groups in years shown in columns) in both eyes open and closed conditions (rows). The EEG processing here was performed purely as a proof of concept to illustrate the potential of using high performance computing (HPC) resources for hypothesis discovery and testing in EEG neuroimaging. Image credit: Delorme, A., Majumdar, A., Sivagnanam, S., Martinez-Cancino, R., Yoshimoto, K., Makeig, S. (2019) The Open EEGLAB portal. IEEE Transactions on Biomedical Engineering (2019 NER Conference), San Francisco, CA. March 20-23, 2019. Even though electroencephalography (EEG) has been used for almost 100 years, this safe and painless test of brain activity remains an efficient method for recording aspects of rapid brain activity patterns supporting our thoughts and actions. Leveraging the power of the Comet supercomputer at the San Diego Supercomputer Center (SDSC) at UC San Diego, campus researchers have demonstrated they can efficiently analyze more than 1,000 EEG 128-channel high-density data sets via the new Open EEGLAB Portal running on SDSC’s Neuroscience Gateway (NSG). Developed by Arnaud Delorme and Scott Makeig of UC San Diego’s Swartz Center for Computational Neuroscience (SCCN) in collaboration with SDSC researchers Amitava Majumdar, Subhashini Sivagnanam, and Kenneth Yoshimoto, a first report on the Open EEGLAB portal was presented at the March 2019 International IEEE EMBS Conference on Neural Engineering in San Francisco. In this report, Delorme and Makeig build on their collaboration with the Child Mind Institute Healthy Brain Network (HBN) project to demonstrate how high-performance computing (HPC) can be used for effective analysis of large EEG datasets. To date, difficulties in relating scalp recordings to activities in specific brain structures, individual differences in head and brain shapes and sizes, and difficulty in harnessing sufficient computer power have discouraged researchers from attempting sophisticated source-level analysis of very large data sets. With a goal of better understanding human brain development, the HBN project is currently collecting brain scans and EEG recordings, as well as other behavioral data from 10,000 New York City children and young adults – the largest such sample ever collected. “We hope to use portals such as the EEGLAB to process this data so that we can learn more about biological markers of mental health and learning disorders in our youngest patients,” said HBN Director Michael Milham. The report by Delorme and colleagues demonstrates that source-level analyses of brain dynamics are now feasible and can become routine in the near future, as continuing advances in machine learning methods are applied to an ever wider range of biological data.